A 15-year-old boy was stabbed to death in a Bronx bodega on Wednesday night. Ken Buffa reports. The stabbing death of a New York City teen outside a Bronx bodega has captured the attention of music stars Rihanna and Cardi B, as well as former Knicks star Carmelo Anthony and his wife, actress and TV personality Lala Anthony. 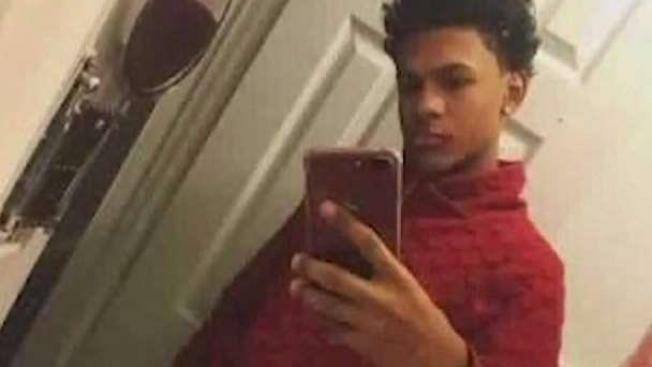 Lesandro Guzman-Feliz, 15, was chased out of the store in the Belmont neighborhood of the Bronx Wednesday night by five men and repeatedly beaten and stabbed with a machete, according to police. The men fled in two separate cars, police said. The assault was captured on surveillance video and widely shared online. Graphic video footage shows the bloodied teen stumbling on the sidewalk before running to a nearby hospital where he died from his injuries before he could get medical help, police said. Rapper Cardi B, who is from the Bronx, took Instagram Sunday to pay tribute to Guzman-Feliz, known to his friends as Junior, and send condolences to his family. In a message written in Spanish, the "Bodak Yellow" singer called the teen’s tragic death a mother's worst nightmare and hopes she finds solace in knowing that she has a guardian angel. "Soon you feel more protected because you will feel your son’s presence and he will give you signs that he is with you. I hope your family finds peace soon and may God always keep your son in his Glory," the rapper wrote. Cardi B concludes the post by drawing attention to the GoFundMe page set up by family members to help cover Guzman-Feliz’s funeral-related costs. The “I Like It” singer donated $6,000 to the fund. In a separate Instagram post published Friday, Cardi B called for #JusticeforJunior, a hashtag that emerged as police sought to identify the suspects in the surveillance video in connection to Guzman-Feliz's death. On Sunday, Rihanna also took to Instagram to call for #JusticeforJunior, posting a photo of the teen with the caption: "can’t stop thinking about this poor baby boy, and how his family must feel right now! I’m sincerely praying for your healing and #justiceforjunior." Later Sunday, the NYPD announced they identified one of the suspects as 19-year-old Kevin Alvarez, of the Bronx. He was arrested the same day on charges of murder, manslaughter, and gang assault. Information on his lawyer wasn't immediately available. Six others, men between the ages of 18 and 24 from the Bronx, Long Island and Paterson, New Jersey, were charged Monday in connection to the deadly stabbing. Meanwhile, Lala and Carmelo Anthony visited Guzman-Feliz's family at their home in the Bronx Monday. The "Power" actress spent part of her birthday paying her respects to Junior, later writing on Instagram she wanted to offer her love and support after learning the slain teen was a fan of her husband. "I can't imagine this type of pain and sadness. His family is strong and may God bless them forever. Seeing his family smile when we walked through that door is something I will never forget. Putting my arms around his mom is something I will never forget. Being in his room is something I will never forget," Lala Anthony wrote. A memorial for Guzman-Feliz continued to grow Monday. Family and friends of the boy, who had been part of the NYPD’s Law Enforcement Explorers program, say his attackers mistook him for someone else. His aunt and father said Sunday night they were touched to see a crowd who gathered to mourn the boy and relieved to have heard about Alvarez's arrest.